The 1-809 is a single channel vibration monitor designed to measure and protect critical machinery. The 1-809 is a single channel Vibration Monitor designed to measure and protect critical machinery. The machinery vibration level is displayed on a 4-digit LED display. The reading can be displayed in inches per second (ips) velocity, g’s acceleration, or mils displacement. A 4-20 mA output signal is provided proportional to a pre-determined vibration level. Two alarms are provided for early warning or machine shutdown due to excessive vibration. 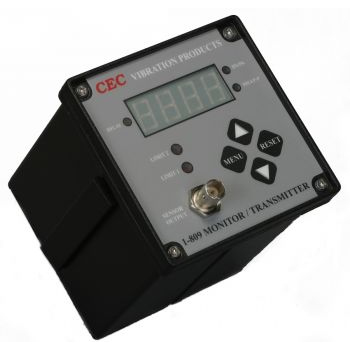 The 1-809 is a panel-mount vibration monitor designed to accept a velocity or acceleration transducer input. The input signal is filtered via an order-specified bandpass filter with very sharp cut-off characteristics. This allows the 1-809 to track only those energies present within the filter’s band-width. The resulting vibration level is then displayed on the 4-digit LED display located on the front panel of the 1- 809. The display indicates the current vibration level in user-specified units, velocity (ips, peak), acceleration (g’s, peak), or displacement (mils, peak-to-peak). Two programmable alarms are provided to indicate warning when trip levels have been exceeded. A start-up trip delay of thirty seconds is available to prevent false alarms during start-up situations. The 1-809 also includes a scaled 4-20 mA output for use in PLC and DCS applications.